Most of the present research problems require the participation of scientists who can bring complementary skills. For this reason, research collaboration among scientists from different disciplines have become very common in interdisciplinary science. Understanding knowledge evolution and scholarly impact of collaborative research is very important to explore its contribution to the overall progress of science over the time. With the advent of modern technologies, scientific collaboration in different research areas has been expanded not only to various sectors and industries but also across regional and international boundaries. This eventually yields scholarly competence and contributes towards knowledge evolution. 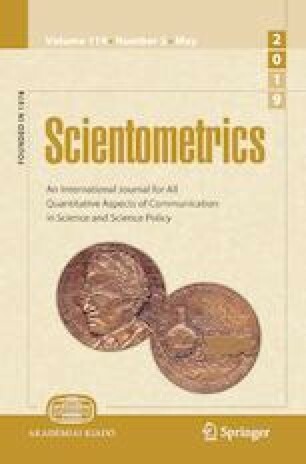 Both the economic imperative demands and enrichment of individual’s command of resources and techniques to address increasingly interdisciplinary research issues have triggered an upsurge in intra- and inter-country collaborative research trends. There are many bibliometric methods available in the literature for exploring various aspects of such collaborative efforts. To date, however, there is a lack of a conceptualized framework that can be followed to explore knowledge evolution and scholarly quantification for any research domain. Using metadata from scholarly publications and bibliometric methods, this study first proposed a research framework for exploring knowledge evolution and scholarly quantification of collaborative research. To understand topical knowledge evolution, collaboration dynamics and their impact on research outcomes, the proposed framework was then employed to the project management research.